Or view larger version. 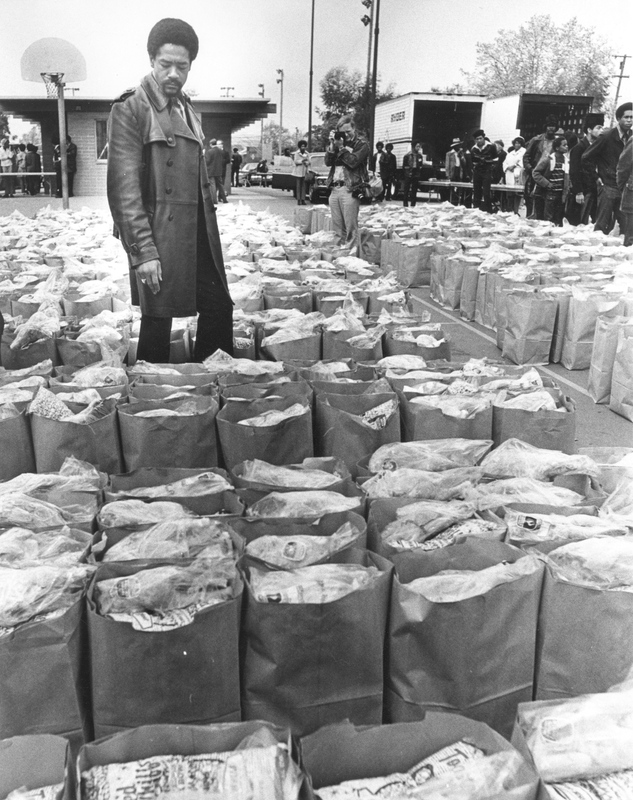 Bobby Seale Checks Food Bags. March 31, 1972. Howard Erker, photographer. Gelatin silver print. Collection of the Oakland Museum of California. The Oakland Tribune Collection. Gift of ANG Newspapers. This is a photograph of Bobby Seale, the chairman of the Black Panther Party at the Black Panther’s Black Community Survival Conference held in Oakland, CA in March 1972. It was a three day conference which was meant to raise funds for the Black Panther Party, get residents registered to vote and to give away bags of groceries. Giving away bags of groceries was meant to encourage African Americans to boycott white owned businesses that were in the black community.